a cavalcade of art-in-progress celebrating the discipline of revision with a fine assortment of unfinished pieces of all styles at . . .
Wednesday, November 19th at 8pm in the Dark Lab of the Digital Arts Research Center. 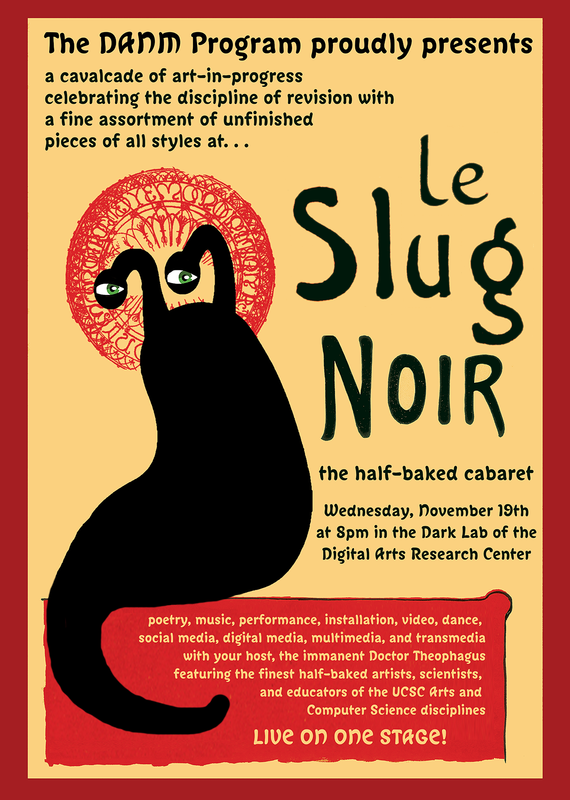 poetry, music, performance, installation, video, dance, social media, digital media, multimedia, and transmedia with your host, the immanent Doctor Theophagus featuring the finest half-baked artists, scientists, and educators of the UCSC Arts and Computer Science disciplines LIVE ON ONE STAGE!